So over Christmas my brother introduced me to Mixology on his iPhone which I rapidly found is also available on the Android platform. I decided to start using it to reinstate the Friday happy hour using the feature that allows me to check what I have in my cabinet and make something out of it. For starters, a French Martini. Honestly, I found this to be way too much raspberry, but if that's your thing then have at it. 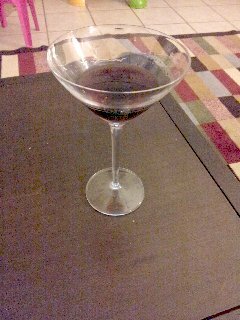 Basically it's 3 parts vodka to 2 parts raspberry liqueur shaken with ice and strained into a martini glass. Enjoy!